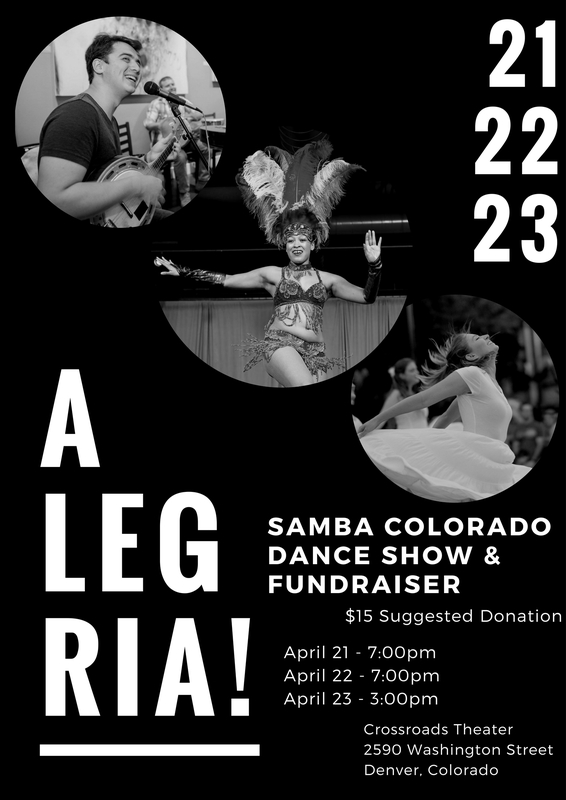 Join Samba Colorado Dance School & Company for “Alegria!”, a Brazilian dance show and fundraiser, choreographed and directed by Kebrina Josefina De Jesus and inspired by Master Brazilian Dance Teacher Rosangela Silvestre. In Portuguese “Alegria” means joy or happiness. Samba Colorado invites you to experience the pure joy of embodied liberation. We will take you on a journey from Salvador da Bahia to Rio de Janeiro through our new dance theatre piece that combines deeply spiritual Afro movements honoring the Orixas (deities of the Candomble religion) enriched with modern Samba elements. We will explore Brazilian culture and the African Diaspora in Brazil and tell stories of ancestral and personal journeys to healing and freedom. Samba Colorado is proud to bring this empowering work to the community. Art is activism and a powerful healing agent. In these uncertain times these conversations serve to remind us how to connect to our roots to fight for individual and collective freedom through artistic expression. This unique dance event will serve as a fundraiser for Samba Colorado to provide necessary tools for furthering our work in the community. Rosangela Silvestre’s mentorship and guidance through her contemporary dance technique that unifies the physical body with its connection to the Universe, which Silvestre calls, ‘the Body Universe’, has inspired our first public work to benefit our youth outreach program in Colorado public schools. Rosangela’s influence on Samba Colorado has helped our dancers grow personally as well as artistically. This show is a symbol of our gratitude to her for her dedication to healing the world through movement. “Alegria!” is playing at the Crossroads Theatre Denver at 2590 Washington Street in Denver, Colorado. Showtimes are Friday April 21st at 7:00pm, Saturday April 22nd at 7:00pm and Sunday April 23rd at 3:00pm. Friday and Saturday shows will be followed by a talkback with the artists. Tickets are $12 in advance, $15 at the door. or call us at 720-583-4327.